I did it! I solved the case of my crooked yarn cakes! 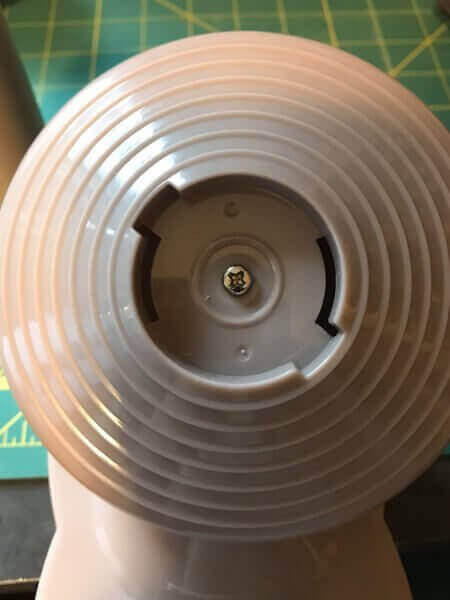 I imagine others may have this same issue happen with their ball winders so thought I would put a post together on how to fix your yarn ball winder. You can see from the before and after images below that something was definitely off! The particular brand I purchased is the Knit Picks Yarn Ball Winder but I imagine many of them are built the same way. 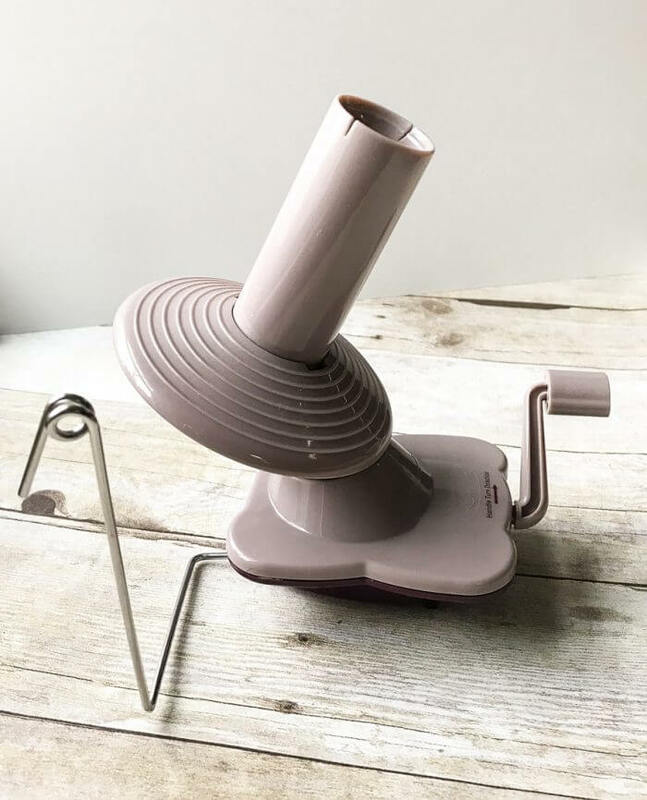 This ball winder is a little work horse for me and for the most part does a great job winding yarn into nice little cakes. The first time I noticed the cakes not winding right I called Knit Picks and they were very good about getting a new ball winder out in the mail to me. But then when it started happening again I figured it must be something in the internal mechanism that needed adjustment so I took the winder apart to see. 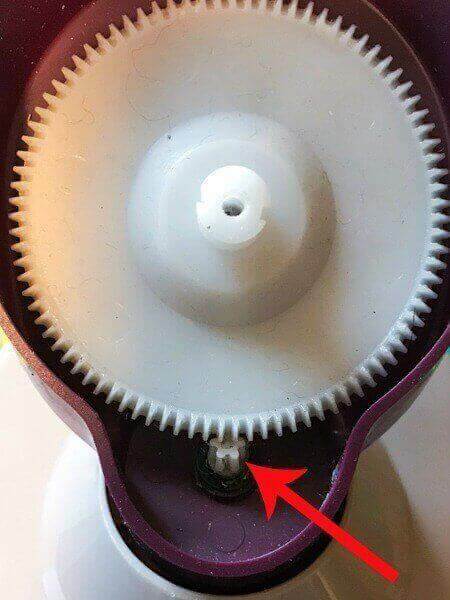 Here is how to fix your yarn ball winder. First you will need to twist off cone shaped bobbin from the main base of the winder. Next, using a phillips head screwdriver, remove the screw from the plate underneath where the bobbin was removed and then remove the plate and set aside. Ahhh … here was the issue! You see how in the photo below the larger plastic gear is sitting on top of the small gear? This is why the winder wasn’t winding properly. The gears should be meshed together so that the teeth fit together. 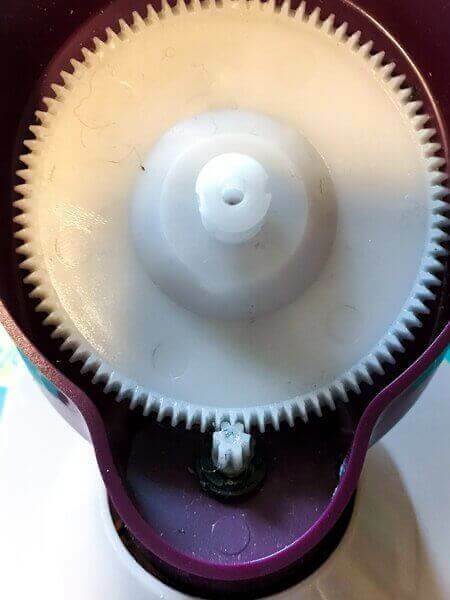 To fix this, gently push the larger gear back away from the smaller one and down until the teeth mesh. It should now look like this. Now screw the top plate back on, replace the bobbin, and try it out. Perfect! Have you had this problem? I would love to know if this helped fix it. Let me know in the comments below. Now that you have your yarn cakes made, read my clever yarn hack for how I keep them wound neatly and keep them from turning into a tangled mess while in use or in storage! Oh my gosh, my kitten knocked over my ball winder and it was all screwy! This worked perfectly!!!! Thanks so much! OMG, I’m so thankful I found this! I got it 3 days ago and was so not wanting to send it back. Thank you for posting this! Wife was about to throw some yarn out! With your help, I was able to fix it, thanks!! To fix it, I wrapped a small rubber band below the gear to space/lift the gear to the right level for the teeth to fit. I have no receipt or record from when I originally purchased it from kp, so I just keep fixing it instead of replacing it. $20 over 8 years is pretty good value in my opinion. Im pretty sure i can keep it going longer provided the plastic stays good. Thank you! Mine was so messed up I had to take the screw off the bottom as well and completely reposition it. From all the comments, it seems to be a design flaw! Bless you! I was about to order a new one and was so upset, then I found this! It only took a few minutes to fix and it’s working like normal again. I hope you’re on Ravelry with this info, I’m sure there are lots of people who would benefit! Thank you sooooooo much!!!!! I was so sad last night when I realized my ball winder was being weird. I tried taking it apart and had no idea what I was looking at so when I found your site I was so thankful. I fixed it in just a few minutes thanks to you. I was so afraid I was going to have to deal with trying to see if I could get a replacement. Thank you again!! Thank you so much for writing this. I was heartbroken when my knit pick yarn winder was acting up. I was about to jump the gun and buy an expensive yarn winder which I do not really want to do. You save me from my woes. I am glad I found your article. 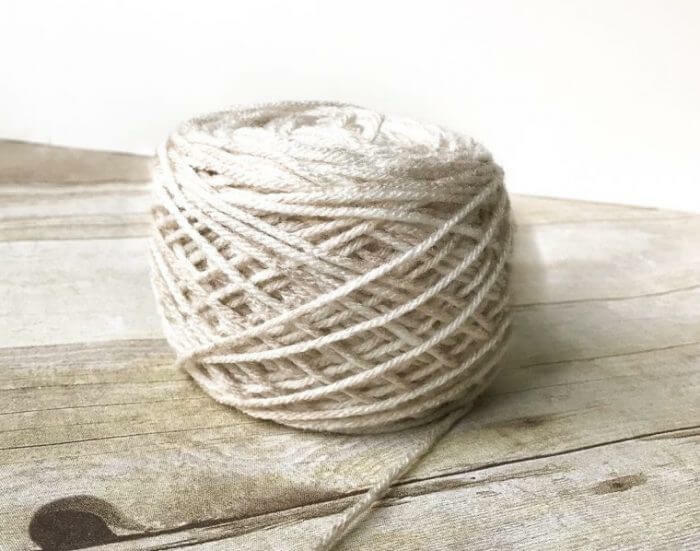 I am back to getting perfect cake yarns. Again, a million thanks. Thank you so much for this information. I have a Knit Picks winder also and one of the screws came out and when I reassembled it my balls were winding lopsided. Your tips allowed me to reassemble it properly. thank you! i was about to order a new one! Yes! My KnitPicks ball winder did the same thing. I have a sneaking suspicion that this has happened to a lot of people. Wasn’t as easy for me to get the gears to mesh but finally got it done. Next time, I get a good winder. Do you also have a fix for a yarn winder whose handle is turning but not engaging at all with the gear? Thank you, you absolute BLESSING! I couldn’t figure out why my yarn balls were all wonky, but thanks to this, I fixed it and now they’re perfect! Thank you! Great information! I have a yarn winder, and I’ll know how to fix it when I encounter this problem. I don’t have a yarn winder, but if you had to fix a brand new yarn windser, wouldn’t this be a manufacturing defect? I’m glad it’s an easy fix to do at home, though. Hi Diana 🙂 It could be … but mine were not brand new when this happened. I had each for a time before they started acting up. And mine get A LOT of use. The reason why I went with their ball winder was because someone in the comments said their ball winder was an entire year old and Knit Picks still replaced it for free because it stopped working. But it’s definitely worth looking inside to see if it’s this easy of a fix first! Yes, definitely. They took mine back no problem. But now that I see what an easy fix it was I’m glad I didn’t have to do that again. This morning before I checked my email I got out the yarn winder I got at a yard sale and started organizing my stash. How weird that you would post this today…great minds think alike! Such a simple (I love simple, don’t you? ), quick fix…..and logical. Saves time & money waiting for a new ball winder to arrive in the mail. And who doesn’t like to save both, especially the money, right? Thank you for taking the time to solve this problem for me. I appreciate it. Bright blessings & happy week to you! !